"Invading Russia. It is always a bad idea." -- Field Marshal Bernard Montgomery, Britain's top commander in WW II, when asked to compile a list of military blunders to avoid, put this at the top of the list. It was an obvious reference to Operation Barbarossa, the German invasion of the Soviet Union on June 22, 1941. Winston Churchill on the German boast that they had the Italians on their side in WW II: "It's only fair. we had to have them in the last war." Even if you're a novice World War II history buff, you'll recognize the designation Operation Overlord as the preparations for and invasion of Normandy on June 6, 1944 by the Allied Forces -- mainly the U.S., Great Britain and Canada. Perhaps if you're a regular reader of World War II magazine, which comes out six times a month, you'll recognize the massive Soviet assault on June 22, 1944 against Germany's Army Group Center in Byelorussia, now the independent country of Belarus. As Kenneth C. Weiler writes in "Why Normandy Was Won: Operation Bagration and the War in the East 1941-1945" (Ostfront Publications, Hanover, PA, 488 pages, photos, maps, glossary, bibliography, index, $24.95, available from the publisher or Amazon.com) "Germany lost more than 300,000 men in twenty-two divisions in just five weeks; this was a blow from which the Ostheer (the German Army in Russia) never recovered. In order to stabilize the front, the German command was forced to transfer forty-six divisions and four brigades to Byelorussia from other sectors, taking some of the pressure off the British and American troops in France." Weiler says he started out to write a technical treatise on Operation Bagration, coming a few weeks after D-Day, calling it Stalin's "somewhat reluctant support to assist the Allied landings at Normandy, by presenting the Germans from transferring combat units from Russia to France to repel the western Allies." As he wrote about Bagration, timed on the third anniversary of the German invasion of Russia, he decided to broaden the scope of the book and make it a primer on the war in Russia in general and a discussion of Operation Bagration in particular. "All the experts on the subject told me I was wrong, that I should focus, focus and focus," he wrote me. "The present book is my attempt to fill in the knowledge gap in the younger reading population -- many of whom didn't even know about the Soviet Union's role in World War II. Recently books have been written on specific, individual battles in Russia but none of these examine the entirety of the war in Russia, especially the connection with D-Day." Weiler put the technical material in footnotes -- which are actually at the bottom of each page -- and created glossaries, appendixes, a comprehensive index, a bibliography, and a chronology, making the narrative flow more easily for the general reader. His book serves a dual audience -- general readers interested in WW II history, and specialists who want all the facts and technical details on the tanks involved and other armament. If you're a tank fan, you'll overdose on the descriptions of the various German, Russian and U.S. tanks, since the battles depended on tanks. You may be surprised to learn how much the Germans and Russians also depended on horses. The armies weren't as motorized as people think today and relied on original horsepower. I was familiar with the Lend-Lease program, where the U.S. shipped huge amounts of vehicles and arms and other supplies to the Russians to fight the Germans, but I didn't know how much the Russians loved the sturdy, reliable Jeeps and the Studebaker trucks that were sent. What a time, when American vehicles were the ne plus ultra in reliability! In fact, Studebaker became the generic Russian term for "truck!" And the Russians, who loved to say they invented everything, claimed that the Lend-Lease Jeeps, with English instrument lettering and mph instead of kph speedometers were "export models" made in Russia! Younger readers might not recognize the name Studebaker, based in South Bend, Indiana, because the company, founded as a wagon maker in 1852, built its last car in December, 1963, but it was an independent manufacturer of quality vehicles (My first car when I was in high school in Illinois in 1955 was a 1941 Studebaker Champion rescued from a junkyard) and was part of the "arsenal of democracy" during WW II. 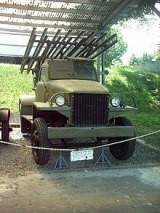 Link to article about Studebaker' model US 6 2 1/2 ton "deuce and a half" trucks: http://en.wikipedia.org/wiki/Studebaker_US6. The Germans weren't alone in staffing their army; they had no choice given that the country's population was less than 70 million in 1939 --- compared with 190 million for the USSR and about 130 million for the U.S. -- compelled them to seek allies. Weiler deals extensively with countries like Italy, Finland, Hungary and Romania that fought alongside the Germans, as well as individuals from dozens of occupied countries, including France, Norway, Denmark, Holland, etc. and even prisoners of war from Russia. "Germany's Ost Einheiten, those units made up of troops from Germany's Axis partners, is a great unknown story of the war in the East for the American readership. The ability of Germany to continue to recruit these significant numbers of men, especially after 1943, was based simply on the fear of their parent governments had of the wrath of the Russians, quickly approaching their eastern borders. Another unknown aspect of the Axis allied nations was the misnomer of their poor performance in battle with the Red Army. This is just now being addressed, for example, with an excellent recent work on the Italian divisions with Hope Hamilton's Sacrifice on the Steppe. "Sympathy for these 'little nations' allied with Germany, which were both somewhat opportunistic (land grabs) and seeking revenge for actual or perceived losses/insults over the centuries, is an issue that is also needing extensive review and scholarship. They saw the power of the German army in Poland and when the worlds most modern mainland European army collapsed, the French, they saw an opportunity to expand their national wealth at the expense of the U.S.S.R. As Citino points out, there was no love lost amongst the Baltic nations after the big red neighbor to their east annexed them in 1940. "The article is a typically well written piece by a noted author on the German army. I have every book Citino has written and have learned a lot from him, although David Glantz is, to me, the dean of Eastern front American authors and experts. He was kind enough to have me visit him at his home twice to review my book when it was in manuscript form and was very helpful in providing direction and guidance." Weiler even presents a brief counterfactual scenario about what might have happened had the Germans treated the conquered countries and their people humanely. The Germans might have been considered freedom fighters, liberating Ukrainians and others from the Communist yoke. Why read Weiler's book? It's a companion work to all of the books written about Operation Overlord. Connecting the two major fronts in Europe, "Why Normandy Was Won" explains the importance and interdependence of the Eastern Front and the events of D-Day. Weiler stresses that Operation Bagration in no way diminishes the heroism of those fighting the Germans in Normandy, but it would have been far more difficult if they had to face the battle-hardened frontline troops that were fighting a losing war in Russia. Ken Weiler, a former Staff Sergeant in the United States Army with the Department of Engineering and Military Science at Fort Belvoir, Virginia also was the legislative liaison NCOIC with the Army's SAFEGUARD anti-ballistic missile program at the Department of Defense at Arlington, Virginia. He has written several learned articles on historical writing and artifact preservation, is on the Board of Directors of the Hanover Historical Society (Pennsylvania), and is a Trustee with the Eisenhower Society in Gettysburg, PA. He holds degrees from George Mason University in Fairfax, Virginia and the University of Virginia in Charlottesville. He lives with his wife in Hanover, Pennsylvania. His website:www.ostfrontpublications.com.